On May 31, 2011, I-95 saw one of its most devastating accidents of the year. 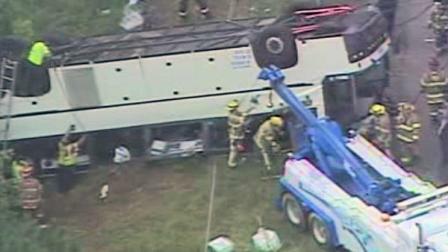 A Sky Express commercial bus from Charlotte, North Carolina overturned on Interstate 95, 30 miles north of Richmond. Four people were killed and over 50 others have been wounded and are currently being treated at hospitals around Caroline Country. Their injuries range from minor to severe. The driver of the bus received suffered only superficial harms. In order to investigate and transport all of the wounded people, the North side of I-95 was closed to traffic until about noon that day. The bust left North Carolina at 10:30pm Monday night traveling towards Chinatown, New York. Between 4am and 5am, the bus ran off the side of the road and flipped onto its roof. The Washington Post quoted Virginia Governor Bob McDonnell as claiming that further investigation would be needed to determine the exact cause of the crash, while MSNBC claimed in a TV spot that it was due to driver fatigue. If the crash was due to driver fatigue, then the driver or the bus company could potentially face a civil lawsuit for all the damages caused to the victims of the crash. There are potential Virginia injury and wrongful death cases. The Federal Motor Carrier Safety Administration, part of the Department of Transportation, has safety regulations in place to avoid the potential of a drowsy driver on the job. These regulations mainly consist of driving hour restrictions, including the rules that a driver cannot operate a commercial vehicle for more than 10-15 hours a day and at most 60-70 hours a week, depending on whether the company runs commercial buses every day or not. Bus companies as well as individual drivers are held responsible for upholding these standards and drivers are required to keep a precise log of all their actions and time on the job. If the driver of the bus broke any of these laws, then Sky Express or the driver himself could be made to compensate for the terrible events of today.